Arriving at some of China’s most spectacular rice fields it’s hard to see that rise is China’s most important crop. Cultivating rice is an old tradition and the way it happens today is very like how it happened centuries ago. I like this because it means that the rural landscape is not destroyed by heavy and modern machinery. After chaos and a few hours waiting for the right bus in Guilin it is spectacular to arrive outside the small Chinese village Pingan and walk to the hostel on the edge of town with view of rice terraces and forest as far as the sight reach. I thing this is not too attractive to the chines tourists so it not that touristy and the people here continue their traditional life with hard work in the field, primitive houses and simple food throughout the year. We arrived in spring when the fields were prepared for new seedling of rice. 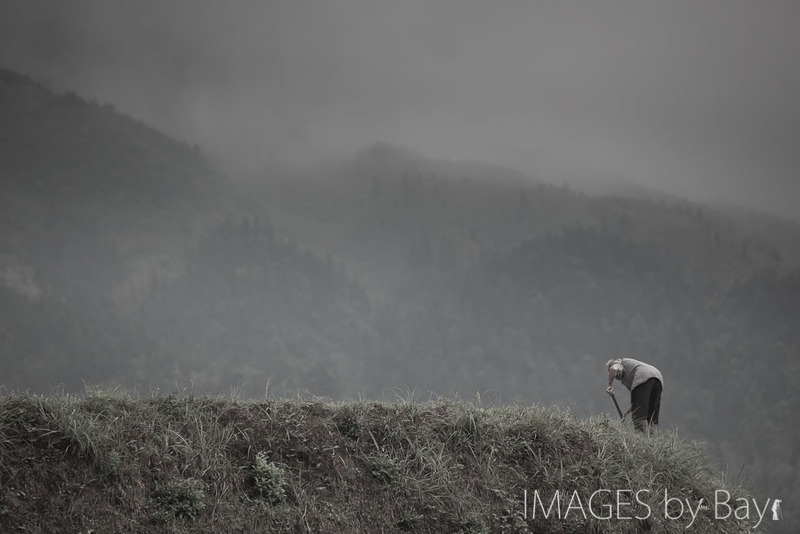 In the fields we mostly see old couples working to prepare the soil and water the terraces for the new seedlings. Al of hard work getting the fields ready and repair dams and slopes. Contrasting modern farming in Europe you will hear birds and frogs singing together with horses and ox walking through the deep mud on the fields. It’s great for the senses and interesting to see have these barefoot farmers walk through the mud and steer the animals. Walking the route between the small village Ping’an and Dazai villages is just what this visit is all about – getting out where tourists are few – and see some authentic culture and rural living (Click to download a map). We did a two days hike from Ping’an to Dazai and back again – which is enough to enjoy the scenery in Dazai and enjoy the trail between the villages. Dazai is more remote than Pingan but it’s still possible to find a place to sleep and some brilliant vegan food. We basically only bought our camera gear and some snacks – if we didn’t had to carry the many kilos of the gear it would have been more comfy but as it is for photographers: PHOTOGRAPHY is FIRST.